Sometimes all it takes is a little nudge for citizen scientists to become career scientists. 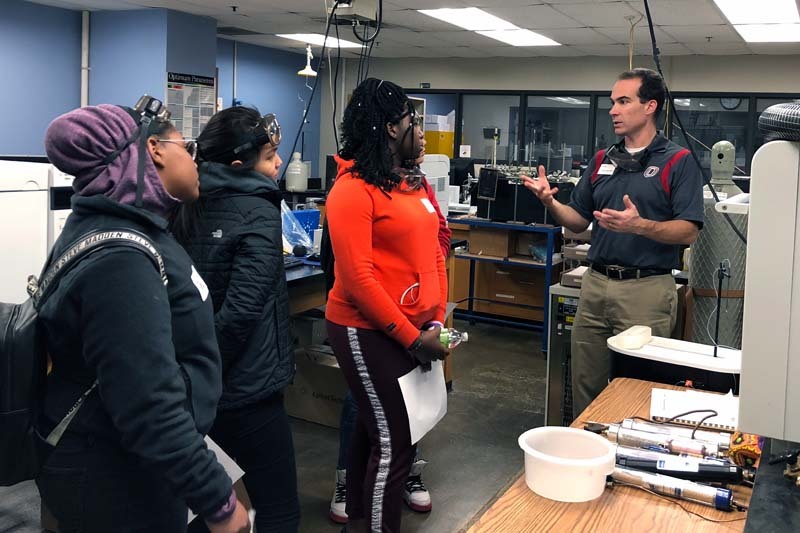 For several semesters, UNO has been partnering with Northwest High School in the Omaha Public School District as well as Omaha's Henry Doorly Zoo and Aquarium's Wildlife Safari Park on a service learning project hoping to provide that nudge. 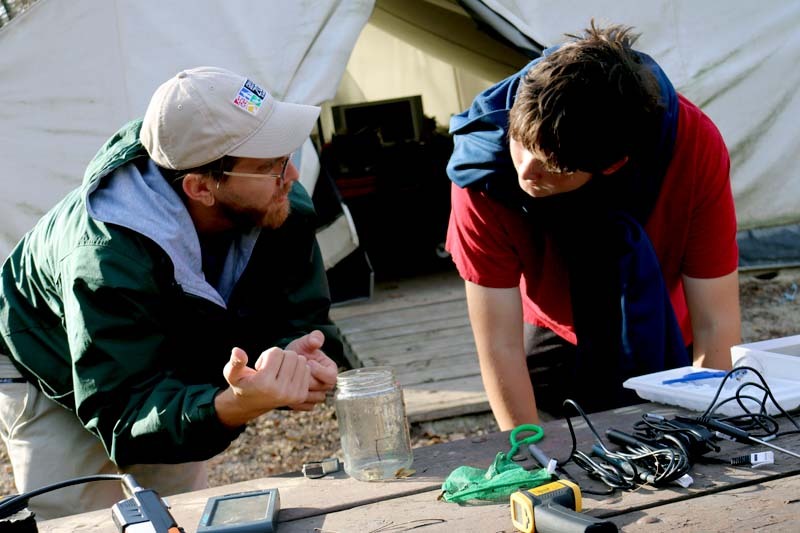 Through the partnership, students from UNO and Northwest collect water and soil samples to later be analyzed by each group in order to provide regular environmental safety reports to the staff at the Wildlife Safari Park. The samples primarily come from a section of Pawnee Creek, a tributary of Nebraska's Platte River. "One of the things that I get passionate about is the distinction between learning about science and doing science; and both are really important," explains Dana Richter-Egger, Ph.D., assistant professor of Chemistry, who oversees the UNO portion of the project through his General Chemistry II lab. "If you only learn about science and you never do science you really don't have a complete understanding, a complete experience of what it's like." As part of the UNO Service Learning Academy's P-16 Initiative, the project was specifically designed to bring together students from a local PK-12 school with a UNO classroom and community member who could benefit from the work. "In all of the projects we help coordinate, the key objective is to improve our community while also showing the next generation that they can be change makers," explains LaTrina Parker, Ph.D., UNO's P-16 Initiative coordinator. "Education is the gateway for students to start making these connections so they can take what they learn in the classroom out into world." That was just what Northwest High School students did on Wednesday, Oct. 24, as they traveled to the Wildlife Safari Park to collect their most recent samples from Pawnee Creek. The samples also included macroinvertebrates - or water bugs - that could provide additional insights based on their interaction with the environment. In a KMTV news story about the project, Pam Eby, education manager at the Wildlife Safari Park, says that she hopes students all become citizen scientists through the process. 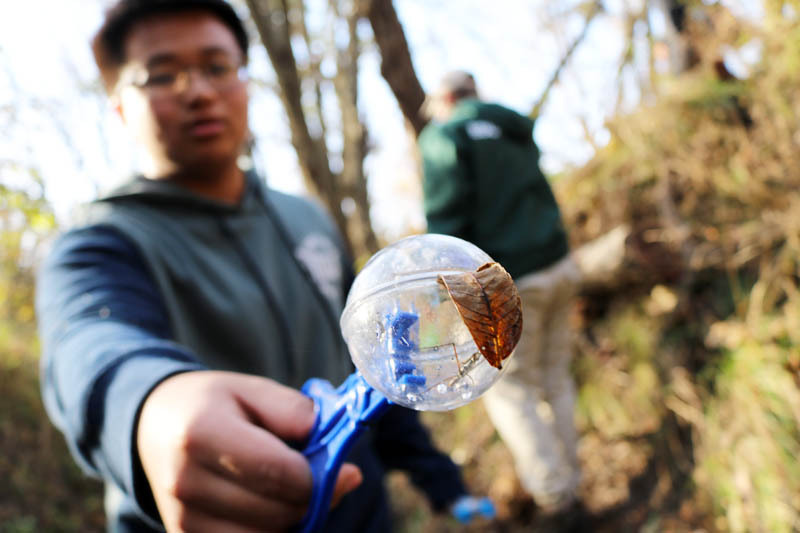 "We want to teach kids how easy it is, to go into your local streams and local rivers — or maybe in a creek in their backyard — turn over a stone and look at the macroinvertebrates that are there, and they can determine themselves how clean that water is." Northwest High School Junior Austin Hampshire adds that the experience is also important beyond the small stretch of the Pawnee Creek. "This is all about the ecosystem and how soil quality, water quality, pH levels, how it all affects the ecosystem, the plants and animals that live here," he says. It is this connection that his Honors Chemistry teacher, Rachel Benzoni, is hoping all of her students can make. "To actually go there and see how it's impacting the wildlife and impacting people who go there and the water that they and their own family relies on that really drives it home for them," she says. "For me, that's the most rewarding part, when kids make that connection of not only why does this matter, but why does this matter to me?" At the end of the semester, students from UNO and Northwest High School will present their findings to Omaha's Henry Doorly Zoo and Aquarium. Richter-Egger and Benzoni don't expect that there will be any concerning findings - but that is a good thing. "We haven't found anything that caused me to go 'Oh my goodness' or something that is completely out of whack chemically," Richter-Egger says. "I hope frankly we don't find something like that but the only way to know is to look and so we're looking." Regardless of the outcome now, or in the future, Richter-Egger and Benzoni hope to continue their partnership with the Wildlife Safari Park. It is an effort that she hopes will encourage others to think about ways to marry community needs and classroom learning. "Don't be scared of getting involved in service learning projects," Benzoni says. "Yes, there will initially be some groundwork to put in and it may take a couple of years to get a good project off the ground, but the impact you see on the high school students, on the community and on the college students is huge."